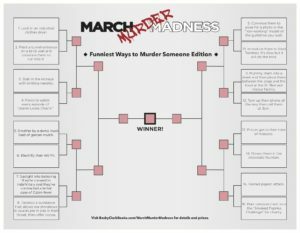 To begin, download the March Murder Madness form here. Choose your winner in the 1 and 2 face-off and type the number in the red box. Email Becky@BeckyClarkBooks.com. Attach your saved bracket with all the squares filled in. Put “March Murder Madness” in the subject line. Fine, Becky, but what might I win?? If you’re one of the first three entries emailed that match the winning individual brackets, you will receive a coveted fab and funny BeckyClarkBooks pen! If you are the first entry emailed that matches ALL the brackets, you are the Grand Prize Winner! You will receive two coveted fab and funny BeckyClarkBooks pens AND a copy of FOUL PLAY ON WORDS! In the event nobody matches ALL the brackets, the Grand Prize will go to the first entry emailed with the most matching brackets. So, get those brackets filled out and emailed PRONTO! The time stamp on my receipt of your email could determine whether you win or lose. Contest runs March 16, 2019 to March 23, 2019. Winners will be notified soon after that at the email you used for entry. Here’s the metaphorical small print … contest is open to U.S. residents only, 21 years or older. This is just a fun way to interact with my readers and offer some small tokens of my esteem. Regardless of how you heard about it, this contest is in no way affiliated with WordPress, Facebook, Twitter, or any other platform. It’s just me being me. So if you’re down with all that … download this interactive PDF, fill out your brackets and get it emailed to me ASAP! This entry was posted in Giveaways, Goofy Stuff and tagged March Murder Madness on March 16, 2019 by Becky.